This is the second half of an article that was posted yesterday. A step mash for a reasonably dry beer — drier than could be made with a single infusion mash. 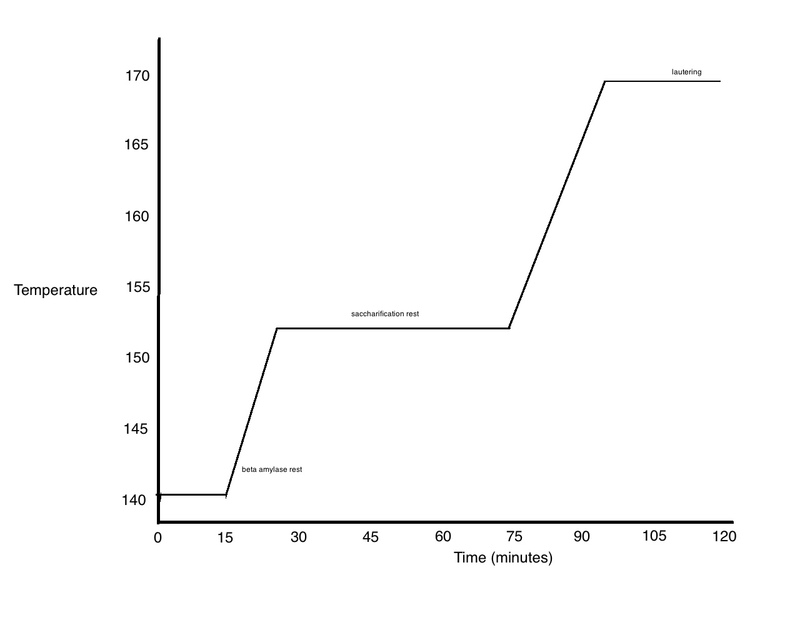 After the beta amylase rest (140–145 °F/60–63 °C), and the temperature ramp up into the saccharification range (148–162 °F/64–72 °C), the rest of wort production is almost identical to a single infusion mash. One difference is that you can choose a slightly higher temperature for your main mash rest. If you were brewing a dry beer and using a single infusion mash, you would likely rest in the 148–151 °F (64–66 °C) range. If you were brewing a somewhat drier beer, you could in the 152–154 °F (67–68 °C) range after the beta amylase rest. Because you’ve already rested at lower temperatures (favoring beta amylase), your main rest can be slightly higher, favoring alpha amylase a bit more, comparatively. Both alpha and beta amylase will be active at both rests, just to varying degrees. In the beta amylase range, the activity of alpha amylase is still substantial (albeit less than it will be at the higher temperature of the saccharification rest). In the saccharification rest, beta amylase activity continues, although it will decline fairly quickly over time. Still — since it has already been working for a period of time at the lower rest — there is less substrate for it to deal with. 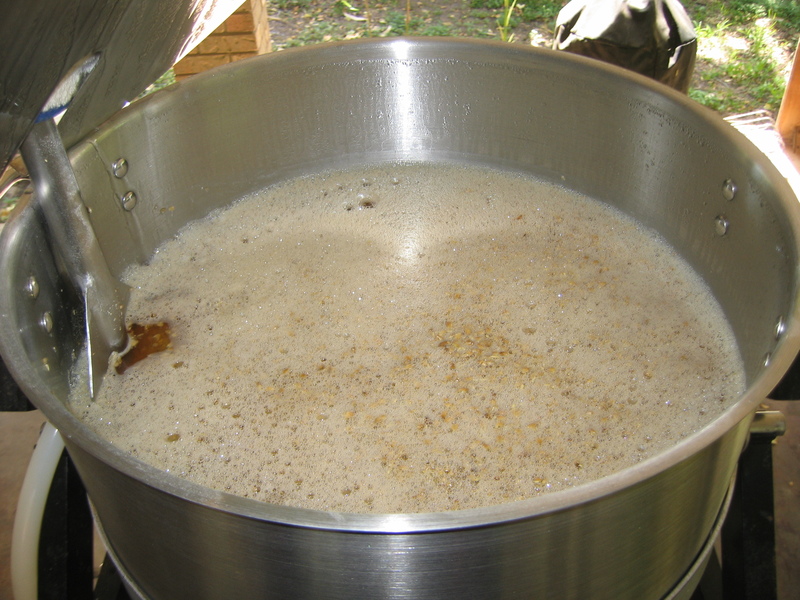 When brewing a dry beer with a heated step mash, I would recommend mashing out — raising the mash temperature to 168–170 °F (76–77 °C) — for two reasons. First, you’ll have a final temperature ramp through the high end of the saccharification range. This will give the amylase enzymes more time to keep working. (It’s not a big deal at this point, but every little bit can help when making a highly fermentable wort.) 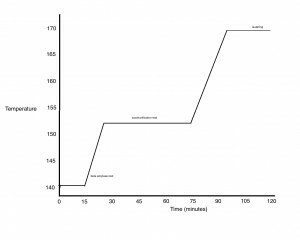 Secondly, if you’ve mashed in your kettle, the mash temperature will drop when you transfer it to your lauter tun. When I use this type of procedure, I mash out to slightly about 170 °F (77 °C) — usually to around 180 °F (82 °C) — to counteract this. At normal mash thickness and pH, you don’t have to worry about extracting excess tannins by exceeding 170 °F (77 °C) — the usual stated grain bed temperature limit near the end of wort collection. Before you scoop your mash to your lauter tun, add hot water under the false bottom (if applicable). When you’re done, simple rinse the kettle for use in the boil and proceed to recirculating your wort prior to runoff. A step mash — even a simple heated one — is always going take longer than a comparable single infusion mash. You can speed up the temperature ramps by supplementing the direct heat with infusions of boiling water. I don’t do this when raising the temperature from the beta amylase rest to the saccharification rest. However, after heating the mash from the main rest to the top of the saccharification range, I sometimes use boiling water to quickly reach 170 °F (77 °C) or slightly over. If you do use boiling water to sped your temperature ramps, you don’t need to add all the water in one single infusion. Estimate how much water you could add — without thinning the mash too much or overflowing your vessels — and the approximate time it will take to boost the temperature. Then use several small infusions to bump the temperature higher. You can cut the direct heat early and use a final boiling water infusion to bring your mash up to your target temperature. If you are trying to make a very dry beer, you may extend the beta amylase rest up to a couple of hours. If you do that, you will want to use high-enzyme malts — such as US 2-row pale malt or Us 6-row pale malt. This will ensure you still have enzymes left when you heat the mash to the saccharification rest. And of course, minimize the amount of crystal or other “body” malts in your recipe to make the most highly-fermentable wort. Next to a simple infusion mash, a heated step mash with two main rests (beta amylase and saccharification) is the simplest of all mashes. And, since you can mash in your kettle, you can perform this type of mash no matter what type of mash/lauter tun you usually use. Mashing at 140–145 °F (60–63 °C) will give the enzyme beta amylase some extra time to work, resulting in a more highly fermentable wort. Once fermented, this will result in a drier beer. For a beer slightly drier than one that could be made with a single infusion mash, mash in to the beta amylase range and then immediately starting heating the mash towards the saccharification rest. For progressively drier beers, rest the mash in the beta amylase range for longer periods. You can rest there for up to couple hours and still see some increase in wort fermentability (although the return on your time diminishes for longer and longer rests). Chris, is it ever appropriate/advisable in a high gravity beer to use a step mash? For example, I’m getting ready to brew an Old Ale with an OG of 1.107. The recipe I’m using has me rest at 148F for 45min and then ramp to 154F for 90min. The FG is supposed to be 1.022 using Wyeast 1028 – London Ale. What are your thoughts? Sure, I often use step mashes when brewing high gravity beers as I don’t like beers that finish high and (to me) taste too sweet.